Failing to recognize these lessons will prove to be a disastrous mistake. How much money do you need to buy a tomato? How much for a roll of toilet paper? If you live in the South American nation of Venezuela right now, you need stacks of bundled bills. Stacks and stacks—too many to fit in your pockets. 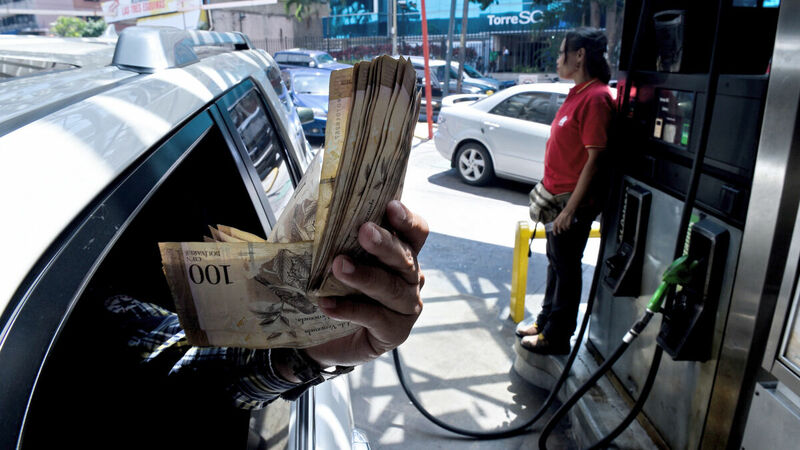 Venezuela is suffering one of the worst cases of hyperinflation in history. Last month, it was 83,000 percent. Prices have been doubling every 26 days. Some cities are suffering electricity cuts. Some don’t have enough water. Food shortages are massive. In some areas, a family needs the equivalent of 22 minimum-wage salaries just to buy a basic basket of food. The average Venezuelan lost 18 pounds in 2016—and 24 pounds last year. Child malnutrition is at a record high. Last year, nearly 400 children starved to death. 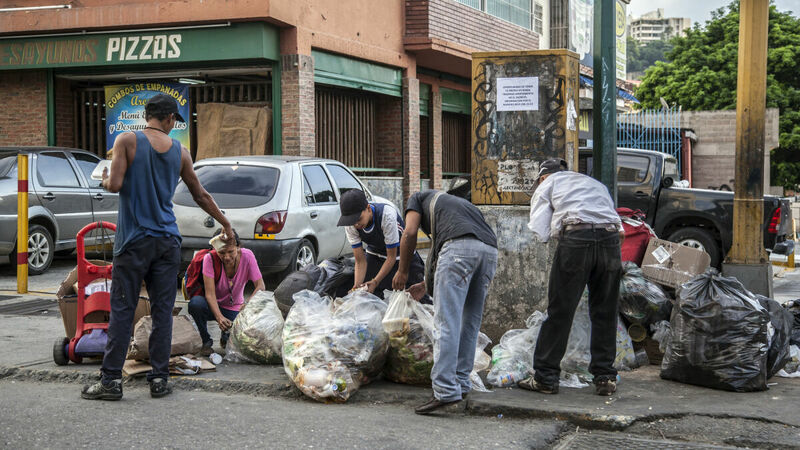 People scour through garbage for food scraps in Caracas, Venezuela. Since 2014, 2.3 million people have fled Venezuela: about 7.5 percent of the population. Proportionally, that equates to 24 million Americans fleeing the country. This exodus is the biggest crisis in the Western Hemisphere. Those who remain in Venezuela are facing the kinds of economic conditions usually associated with something like a civil war. And crime is rising. The only free market in the country is the black market, so Venezuelans are doing what they can to get food and other necessities any way they can. Nearly everyone in the country engages with the black market on some level. Family men find themselves smuggling gasoline and other contraband into Brazil and Colombia. Teachers, doctors and petroleum engineers sell their bodies in prostitution. Formerly respectable people are involving themselves in drug trafficking. Gangs are recruiting teenagers by just offering them something to eat. Government officials do business with gangs, drug cartels and terrorist networks. Venezuela is like a nationwide mafia organization. 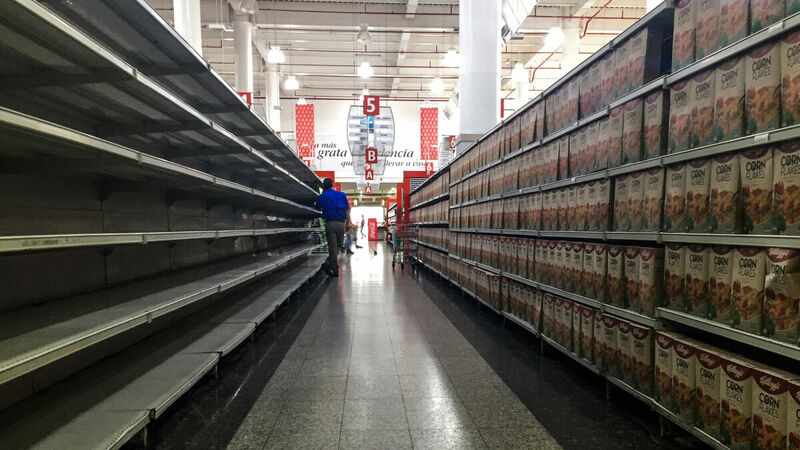 Shelves are empty in a Caracas supermarket. Venezuela relies heavily on imported food, but as the currency is worthless it cannot afford to import food. The food shortage is a massive problem with more than 80 percent of the population eating only once a day. You have probably seen the images on the news. Stacks of 100-bolivar bills that are almost worthless. Huge lines at supermarkets. Impoverished mothers and children looking into empty refrigerators. Women who prostitute themselves in other countries. Emaciated, abandoned pets. People rummaging through trash for food. Major power outages. Massive protest marches. Deadly election clashes with police. Venezuelan migrants blocked from leaving the country. Images of malnourished and elderly, adults and children too heartbreaking to link to. It is a failing state, and there isn’t even a war to blame it on. In 2018, Venezuela is synonymous with government failure, economic disaster and crushing poverty. The almost worthless bolivar currency is of little value in oil-rich Venezuela. What happened? Until recently, Venezuela was quite prosperous. In 1950, Venezuelans enjoyed the fourth-largest per-capita income in the world after the United States, Switzerland and New Zealand—$80,000 per person in today’s money. In 1980, it had the fastest-growing economy in the world. As late as 2001, it was the wealthiest country in Latin America. In 2012, its per-capita gross domestic product hit a high of $18,382 per person. Venezuela has rich natural resources: gold, diamonds and the largest proven oil reserves in the world. How did Venezuela go from being the richest country in Latin America to an economic and humanitarian disaster zone? Leftists in America loved to praise Venezuela in the early 2000s. Here was a natural paradise where a socialist visionary was enlarging the government, taking over big businesses, nationalizing the oil industry, making the society dependent on the government, and handing out benefits to poor people. This was socialism in action! That socialist visionary was a former paratrooper who tried and failed to overthrow the government in 1992 and then won the presidential election in 1998. Despite the nation’s wealth, due to government corruption and mismanagement and the falling price of its major export, oil, Venezuela had a poverty rate of an incredible 50 percent. The people elected a democratic socialist named Hugo Rafael Chávez Frías with 56 percent of the vote. Venezuela’s past welfare programs would pale in comparison to what he was about to do. He promised to end government corruption by giving Venezuela’s wealth to the impoverished masses. He would give power to the people. Chávez was extremely popular. He was charismatic, and he appeared on television, speaking directly to his people, for hours at a time. Most importantly, he handed out so many benefits to the poor. Luckily for him, the price of oil, on which Venezuela’s entire economy depended, continued to soar. Enormous amounts of wealth poured in. Chávez looked like a benevolent genius to his people and to socialists abroad. Over the 14 years of his presidency, he took in an estimated $1 trillion in oil profits, and he used these to fund his massive social programs. The Chávez regime also nationalized thousands of private companies and industries. Chavez said the government would run them better than private owners, and it would distribute the profits to the people. As a result, the poverty rate dropped from 50 percent to about 32 percent at by the time Chávez was reelected in 2006—with almost two thirds of the votes. Liberals across the Western world praised Venezuela and Chávez for demonstrating that socialism can work well. After the examples of the Soviet Union, East Germany, China, Cambodia, North Korea and other socialist states, liberals were eager for a current, real-world example they could hail as a victory for “21st-century socialism.” Chávez’s Venezuela was it. “[L]ook at the positive changes that have happened economically, that have happened in all of South America because of Chávez,” said filmmaker Oliver Stone, who made a documentary called My Friend Hugo, in a press conference in Venezuela’s capital city in 2010. “Venezuela is seriously conquering poverty by emphatically rejecting the neo-liberal policies of the world’s financial institutions,” said Jeremy Corbyn, the current leader of the British Labour Party, in 2009. Chávez had accomplished “historic liberation of Latin America,” freeing it from 500 years of Western force, going back to the time of the conquistadors, according to prominent radical American socialist Noam Chomsky. “These days, the American dream is more apt to be realized in South America, in places such as Ecuador, Venezuela and Argentina, where incomes are actually more equal today [than in America].” This is an excerpt from a 2011 article posted on the website of Vermont Senator Bernie Sanders, who mounted a popular campaign for Democratic nominee for president of the United States. Back then, the message from American and other Western socialists was, Just look at Venezuela! Sen. Bernie Sanders greets demonstrators attending a rally on Capitol Hill. To accomplish his reforms, Chávez took control of all branches of power: executive, legislative, judicial—and military. He eliminated the nation’s Congress and replaced it with a National Assembly, which he controlled. He used this body to rewrite Venezuela’s constitution to keep himself in power, lengthening presidential terms and abolishing term limits. He stacked the Supreme Court with those loyal to him. After his government increased state control over the nation’s oil industry, Chávez fired company leaders he didn’t like and replaced them with people loyal to himself. He effectively destroyed the private sector by confiscating or taking over one industry after another. These moves were popular, but there was a problem. The big government of Venezuela’s “socialist paradise” was indeed strong enough to take things away. Not just businesses and jobs, but freedoms. When journalists criticized the president, he had them jailed. When judges ruled against his decisions, he had them arrested too. When people protested, he had them locked up; some of them were even shot in the streets. When his fellow military officers became uncomfortable with these tactics, Chávez imported agents from Communist Cuba to spy on them. In 2010, Transparency International labeled Chávez’s Venezuela the most corrupt country in Latin America—a region with plenty of candidates for that dubious designation. Yet the cash kept coming in. Oil was still selling for more than $100 a barrel, so the government kept receiving money and kept handing it out. In 2012, Chávez was reelected. This time around, however, there were no international election observers, and there was evidence that the election was rigged. He became the latest “democratic” socialist to promise to give power to the people—and yet to exercise authoritarian measures to ensure he would never lose it. Soon thereafter, Chávez announced that he had contracted cancer. After traveling to Cuba for treatment, he died in March 2013. Conveniently for his legacy, the oil money was still rolling in. He never paid the bill for his short-sighted, reckless policies. Before he died, Chávez picked his successor, Nicolás Maduro. And within a year, the inevitable happened: The price of oil dropped. Oil revenues shrank, and suddenly the real costs of socialism became obvious. Since Venezuela’s per-capita gdp peaked in 2012, it has shrunk 34 percent. The national economy shrank 16 percent in 2016, 14 percent in 2017, and a forecasted 15 percent for 2018. The nation has gone from being the world’s fourth-wealthiest nation per capita to the 131st. Inflation, the general increase in prices, was 112 percent in 2015; it had ballooned to 2800 percent in 2017—and this year is projected to be 1 million percent. Ruling over this wreck of an economy and wreck of a nation, Maduro is determined to hold on to power. In 2013, he won the presidency with 51 percent of the vote in an election that was likely rigged. At that point, the poverty rate was around 32 percent. Five years of economic catastrophe, social upheaval and malnourished oil workers later, Maduro won reelection with 68 percent of the vote. His popularity—somehow—rose by one third. This is puzzling, until you learn that Venezuela again blocked international election observers from participating, and that the British company that provided the voting machines said it found a discrepancy of at least 1 million votes between the vote participation recorded by the machines and the statistic announced by Venezuelan authorities. It is clear that “democratic socialism” has once again produced classic authoritarian socialism. A government big enough to give Venezuelans what they want is a government big enough to tell Venezuelans how they voted. It is clear that “democratic socialism” has once again produced classic authoritarian socialism. Many Venezuelans have rejected the Maduro government’s claims and have protested in the streets en masse. Maduro’s security forces have cracked down on the protesters and journalists. Bolivarian National Guard troops have even arrested people just for recording video of long lines outside supermarkets with food shortages. Meanwhile, the press reports that Hugo Chávez’s daughter has accumulated an estimated fortune of $4.2 billion. It turned out that electing a democratic socialist to end corruption, distribute the nation’s wealth, and give power to the people ended up fostering corruption, crushing the economy, and reducing the power of the people! What a lesson in how socialism can and does go horribly wrong. Just look at Venezuela! A member of the national guard fires his shotgun at protesters during clashes in Caracas, Venezuela on July 28, 2017. Protesters took to the streets in Caracas in a show of defiance toward President Nicolás Maduro. Yet astoundingly, at the same time that this disaster is unfolding, just a few countries to the north, what is the hot political trend in America? This wave of enthusiasm for socialism surged in the last presidential election as young people supported Bernie Sanders. Now, socialists are winning in state primaries. Some of them could win governor’s offices, and some could join Sanders in Congress. Already serving alongside Sanders in the Senate is a Harvard Law School professor, a scholar in bankruptcy law, a leading figure in the Democratic Party—one of the finest minds our educational and political system can produce, the way many would view it. She is the senior senator from Massachusetts and a possible presidential candidate for 2020. Her name is Elizabeth Warren, and she has a plan. She wants the federal government to control every major business in America. You can make all of these ideas sound noble. That’s why socialism is such a powerful force. But human beings have been trying these ideas throughout history, and they have led to disasters like the Soviet Union and Venezuela—every time. This is not just rhetoric. Warren has introduced the Accountable Capitalism Act, a nice-sounding bill that would establish government control over every major business in America (any business with more than $1 billion in sales). She is literally calling for the federal government to take control of more than a thousand of the largest companies in America: The government would directly control 87 percent of American businesses by sales and 97 percent of the entire U.S. economy. It would be the largest takeover of private wealth in human history. And she is proposing this at a time when Venezuelans are literally starving to death due to socialism! Somehow, Warren and fellow liberals can look at Venezuela and still say, That is what we want for America. A majority of young Americans, and most members of the Democratic Party, are saying, in effect, We need to look at nations like Venezuela as a model for having universal health care, for universal education, for free college tuition, for massive minimum-wage increases, for redistributing wealth, for certain price controls. In this case, we have a spectacular failure occurring right under our noses, right now. You don’t even have to read a history book to see this. All you have to do is pay attention and learn the obvious lesson. Socialists want “equality” at all costs. In Venezuela, as in the Soviet Union, as in other socialist countries, they are getting it. Except for the very few within and connected to the ever more powerful government, everyone is equally oppressed and equally poor. Everyone is equal in terms of their value as a human being and their potential. But in almost every other way, we are unequal. We have different abilities, different interests, different opportunities. We have different backgrounds, different levels of achievement, and yes, different incomes. There are certainly exceptions to the rule, but in a free society people who produce more generally end up having more. Hence, “income inequality.” Wealth always tends to be concentrated in a minority. History shows that this often leads to the majority becoming resentful and restless and, in some cases, rising up in revolt. Leaders can gain a following if they promise the masses to redistribute the wealth. The problem is, moving wealth doesn’t create more wealth. Production creates more wealth. And handing people money doesn’t make them more productive. In general, it tends to make them less productive. And taking money from producers makes them less productive as well. On top of that, the more violent the revolution, the more wealth is destroyed in the process. So the result of such revolutions tends to be a general loss of wealth, and a loss of productivity. And once that redistributed wealth is spent, then poverty comes roaring back with a vengeance. This is not just a recent phenomenon: This has happened throughout history. Socialists fail to understand or reject this fundamental truth of human nature, taught by thousands of years of human experience. But the Creator of human beings understands it perfectly. This is why His Word says that if anyone does not work, neither should he eat (2 Thessalonians 3:10). This is why His Word promotes the economic system of every man under his own vine and his own fig tree. This is why His Word says that we all eat the fruit of our doings, that we all receive our own reward according to our own labor, that we each must give an account of ourselves, that He rewards each man according to his works and renders to every man according to his deeds. This is why His Word says that the responsibility of feeding each family rests on the head of that family providing for his own, especially for those of his own house (1 Timothy 5:8). It does not say to rely on government social programs that pay you diminishing amounts of benefits in return for you relinquishing your vote, your power and responsibility over your own life. When a government simply takes from the producers and the wealthy, and gives to the poor in exchange for votes, it is ignoring these basic biblical truths and commands. Every time we do what seems right in our own eyes, we create problems rather than solving them. Our ideas might seem to produce good results for a short time, as they did under Chávez, but the reckoning always comes. It’s a matter of cause and effect. It’s a law, like physics. And the place to learn the fundamental laws of human life is not the mind of Chávez, Lenin or Marx. How flawed is the human mind? Well, Americans live in an economic system that has done more to eliminate poverty and generate wealth than any other system in history—that has lifted millions upon millions of people to a standard of living higher than any other people have enjoyed in history. Yet we are turning toward socialism. Why can’t we just believe God, obey God and hold to the principles of the Bible? Certainly the free market and capitalism are not the perfect systems of God, but they are far more consistent with biblical principles than socialism, communism, feudalism, corporatism or any other economic system besides the actual economic system outlined in the Bible itself. There is another troubling aspect to what’s happening in Venezuela that teaches a crucial lesson, if only we will heed. It’s the way the “democratic socialist” government has transformed into an authoritarian socialist government. Behold the evils of human nature. When you give a leader or a government an enormous amount of power—to control the economy as well as the military, policy, international relations and everything else—the power to take from these people and give to those people—this is what it so often leads to! Over and over again, leaders use “democratic socialism” to come to power, and then they consolidate that power and never let it go. Most democratic socialist revolutions throughout history end up becoming authoritarian. Many turn into full-blown dictatorships. Once the people of a nation concede their individual rights to give their government overwhelming power over their lives, it’s easy for that government to be controlled by a small group or even a single person. And so often, inside those people or that person, human nature rages. These leaders always say they live to help the people. But what they really want is power to remake the nation as they want it. Some of them just want power and wealth—and that’s it. And whether people want to admit it or not, this is exactly what is motivating the socialist movement in the United States. Avowed socialists are openly talking about nationalizing health care, nationalizing 97 percent of the economy, raising taxes, and taking money so that politicians can distribute it the way they believe is just—for example, to provide “free” education in institutions that teach new generations about the glories of Marxism! This isn’t about equality at all. This is a massive power grab! Like Hugo Chávez, these politicians believe that the problems in the free market can be solved simply by stripping power from private enterprise and giving it to the government. As if only private individuals have selfish, evil human nature—whereas socialist leaders have pure, altruistic nature and can be trusted implicitly to always act in the public interest. Their bottom line is, The more power we have, the better off everyone will be! For more than a century, this godless ideology has been progressively infecting America’s government, transforming it from a limited federal government to a more and more massive central government. Yet people like Elizabeth Warren think the government doesn’t yet have enough power! This is exactly the opposite to the thinking of America’s founders. More importantly, it is opposite to the principles of the Bible. Trust the Government? Or Trust God? America’s founders understood many biblical principles. They understood that God was not leading America in the same way that He led ancient Israel through Moses—but they formed a system of government that at least accounted for the truth about human nature revealed in the Bible. They put the opportunity, the responsibility and the accountability for a man’s life where it belonged: on the shoulders of that man himself. The biblical model of government places the responsibility for an individual’s life on that individual. The governmental system is very lean. It gives individuals and families a tremendous amount of economic and personal freedom—and accountability. Socialist governments tax 60, 70, 80 or even 90 percent of people’s incomes and take on the responsibility of doling out the money and benefits that they think people should have. God’s system operates on an exceedingly spare 10 percent flat tax—known as tithing. That alone shows you the difference in scope of God’s government versus human socialist government. The big-government socialist model ignores the principles of human nature contained in the Bible, ignores the limitations of human beings revealed in the Bible, ignores the system of government established in the Bible. It boldly, blindly insists that human nature—at least the human nature of government leaders—is fundamentally good and that the more power you give a socialist government, the better it will be for everyone. It promises that socialism will provide for your needs. It insists that corruption will not flourish in this system. It insists that the only problem is people who don’t trust the ever growing government. God says, Cursed is the man who trusts in man! (Jeremiah 17:5). God wants to help all people to learn responsibility, to work and to grow, and to learn to look to Him for our help, and to trust Him! Blessed is the man who trusts in the Lord—and whose hope the Lord is (verse 9). 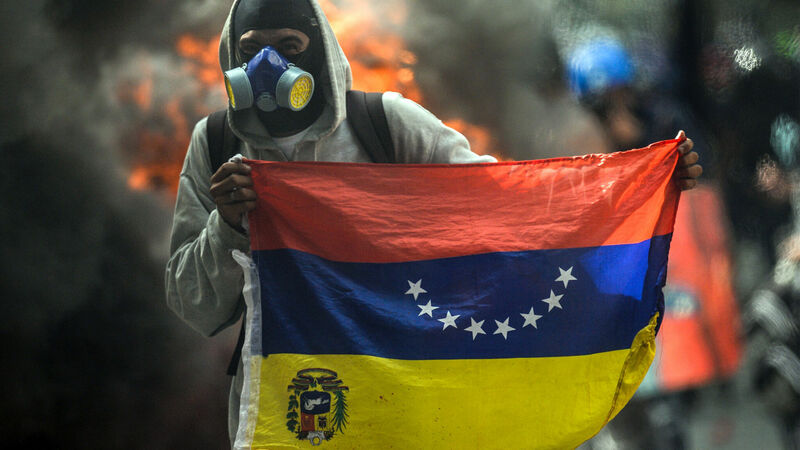 We must learn the powerful, dire, costly lessons of what is happening in Venezuela right now. Something is very wrong with the thinking of Americans today, who will indulge in God-rejecting socialist dreaming while a nearby nation implodes after a 20-year experiment in socialism. Americans are proving to be unteachable. We won’t learn the lessons of the Bible. We won’t learn the lessons of history. We won’t even learn the lessons unfolding on the news before our faces. Socialists say that the Soviets got this detail wrong, or the Chinese got that detail wrong, and that America could succeed if it tried “real” socialism. We are bold enough to say this even though we cannot name a single example of successful, sustainable socialism—and all evidence points to the fact that the premise of the system itself is fatally flawed! We reject the obvious lessons because we are too convinced of our own wisdom. We trust our human reasoning against all challengers—and we will pay a terrible price for that ignorance and arrogance. What will it take to make us teachable? The Bible tells us the grave answer. Our rejection of God and our unteachability will lead directly to terrifying consequences worse than what is happening in Venezuela. Biblical prophecy shows that America will be at the center of the worst suffering in human history. That is what it will take for us to recognize the flaws of human nature, including our own, and the foolishness of trusting in men, including ourselves. God will allow and even apply much of this punishment and suffering. Not because He hates us: If He hated us, He would destroy us. But He loves all of the human beings He has created, and He knows that to achieve our potential, to make our lives worthwhile, we must learn. When we reject Him at every turn and in every way, we leave Him no choice but to punish us for our sins until we relinquish our insistence that we are right, no matter what. Beyond this period of terrible punishment and suffering, our loving Creator has revealed that another revolution is coming. It’s a revolution in government. It’s a revolution in economics. It’s a revolution in human happiness and fulfillment. And it can come about only by the leadership of Jesus Christ. The good news for suffering Venezuelans, for “blind” Americans, and for this whole world is the soon-coming return of the King of kings, Jesus Christ, to literally and directly rule all nations. Only He and God the Father understand human nature. Only they have the ability and capacity to rule human beings the way they should be ruled. Only He and God the Father can guide human beings to fulfill not just their income potential or their happiness potential, but the eternal, incredible human potential for which they were born. Also, please request The Wonderful World Tomorrow—What It Will Be Like, by Herbert W. Armstrong. It will fill your mind with an amazing vision about a future of prosperity, purpose and fulfillment for everyone, achieved by keeping the law of God.